The 30’’ T-Series Grill Head by American Outdoor Grills is made to slide into a cutout on a grill island or outdoor kitchen. The 30’’ Grill Head is the medium sized grill head in the new T series. The T series is unique because unlike the other AOG grills and grill heads, the ignition system runs on neither batteries nor electricity, making it a fully self-sufficient module. The T series grills feature a push-to-light piezo ignition system that eliminates the need for electricity or batteries. Besides the piezo ignition, the new grill heads also feature a stunning amount of cooking space. 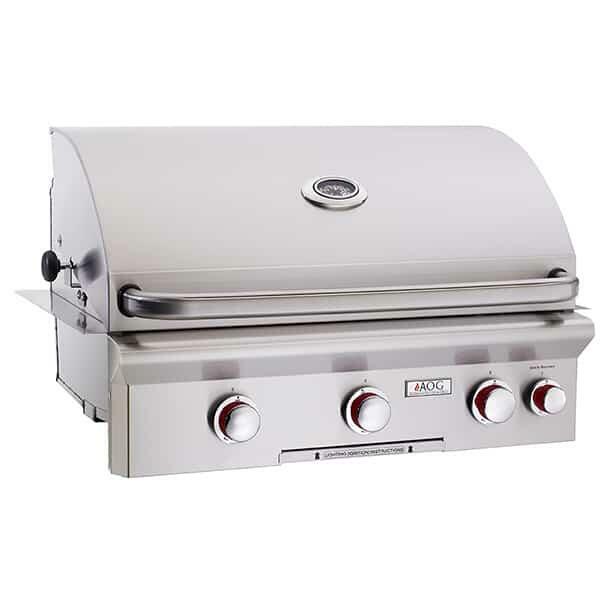 The 30’’ grill head features 540 square inches of primary surface cooking space. The primary cooking surface delivers up to 45,000 BTUs and the secondary backburner offers 10,000 BTUs. You’ll regulate the temperature by keeping an eye on the attractive analog thermometer located prominently on the outside of the grill. The silk-finished stainless steel grill ought to help you to step up your grilling game in more ways than one! Cutout Dimension 30.75" x 19.5" x 8.5"